Workers are putting the finishing touches on the $120 million Dr. Martin Luther King Jr. Memorial, which is scheduled to be complete in about three months. From concept to design, the project along the Tidal Basin is 15 years in the making. Some of the best craftsmen have been flown in from all over the world, including Nick Benson, a third generation stone carver from Rhode Island who also worked on the World War II Memorial. His father carved inscriptions for the Franklin D. Roosevelt Memorial in Washington, and his grandfather carved inscriptions for the Iwo Jima Memorial in Arlington, Va., the Associated Press reported. 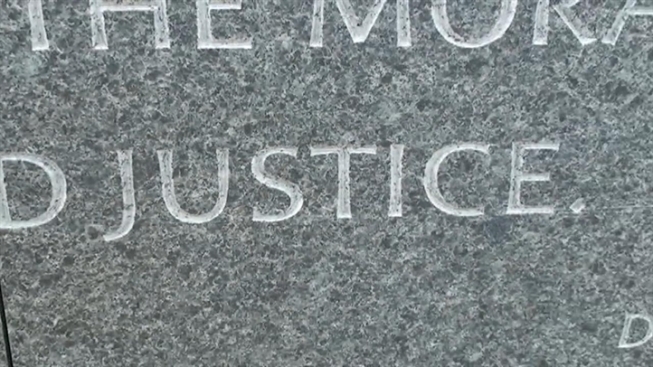 He is trying to bring the words of the civil rights leader alive on the memorial. “These are probably some of the finest words that I will ever carve,” Benson said. Fourteen of Dr. King’s memorable quotes line the interior wall, following the themes of justice, democracy, hope and love. Benson said because Dr. King was a fan of Greek philosophy, he inscribed the letters with a Greek touch as well as contemporary sans serif script.